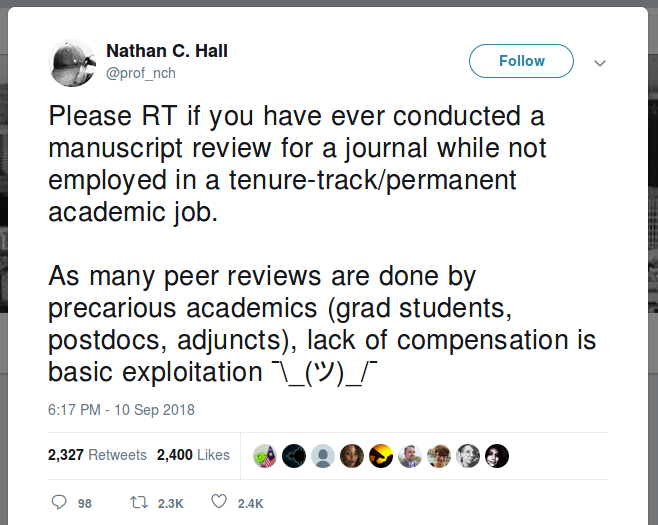 Now, in my time as a graduate student I have peer-reviewed one journal article, and reviewed half a dozen manuscripts from friends, and I have to say that the claim I am being exploited is absurd. Any wise writer sends their writing to a few trusted friends before they send it out into the world. This is such a basic feature of academic life that academia dot edu built a whole module for it, Princeton and Stanford host a series of Working Papers in Classics, and an Australian economist posts drafts of his books one chapter at a time on Google Docs with invitations for readers of his blog to comment on them. When I agree to comment on a friend’s manuscript, asking them for money would be as offensive as inviting them to my apartment for dinner and then sticking a credit-card reader in their face. Trading favours is a basic part of social relations between equals. As scholarly authors, we read other people’s work (and cite it or review it) so they will read ours. Reading yet another article on a subject is tiresome, but we do it because sometimes it will be our article on someone else’s desk when they really want to go to bed and the recycling bin is so very very close. 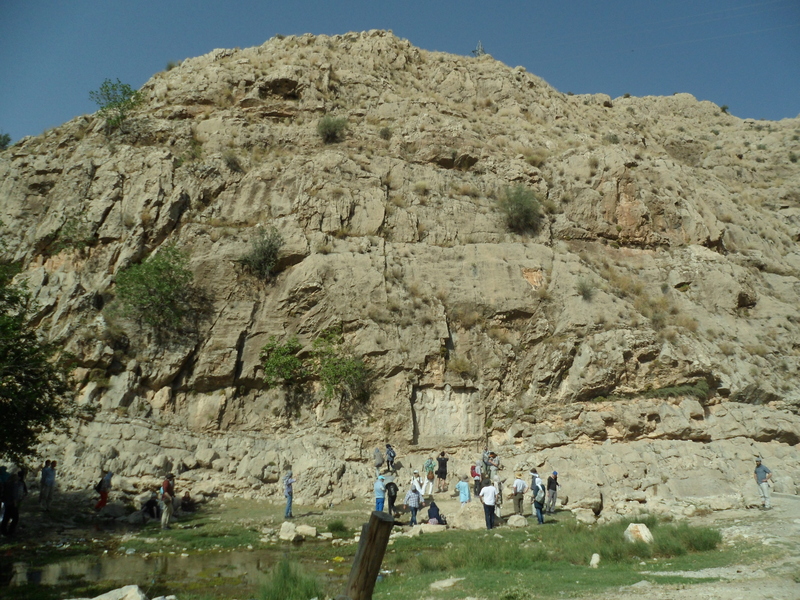 An overview of the relief at the spring, with some Franks admiring it. Photo by Sean Manning, May 2016. On Friday morning a week ago, thick snow was falling on the green leaves in Innsbruck, and someone posted to the agade mailing list that Yale proposes to dissolve the Yale Babylonian Collection as an institution, reassign its curator to other work, and transfer it from the Sterling Library to closed storage where it will not be immediately accessible to scholarly visitors. I suppose that an institution with investments worth 25 billion dollars finds it difficult to afford such luxuries, gathered as they were in a softer time when workers could earn several dollars for a 12-hour shift in a steel factory. If you want to learn more you can find the petition Save the Yale Babylonian Collection on change.org. This week I want to tell a story about another community with heritage to protect and make accessible. Since my view of how research works involves a lot of arguing in front of an audience, how about the debate about who should inherit the armour of Achilles? 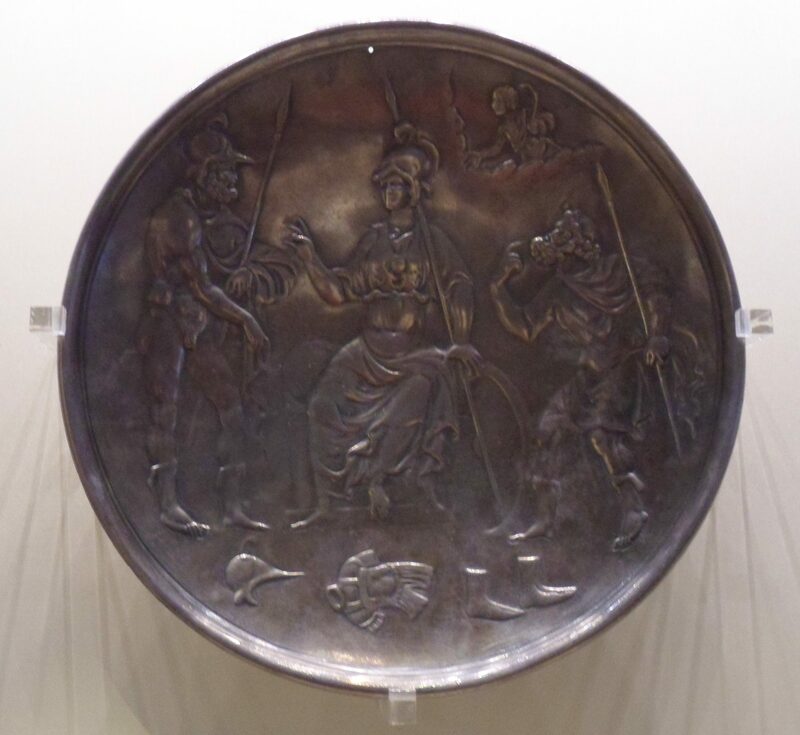 Silver plate in the Hermitage with Ajax and Odysseus competing for the armour of Achilles (number ω-279.) Photo by Sean Manning, September 2015. … I’d estimate that there is now at least one hundred times as much attention given to the scenario of human level AI based on explicit coding (including machine learning code) than to brain emulations. But of course that is not usually the main goal of individual thinkers. We are more eager to jump on bandwagons than to follow roads less travelled. All those fellow travellers validate us and our judgement. We prefer to join and defend a big tribe against outsiders, especially smaller weaker outsiders. Now, I share his frustration when I see large amounts of attention being devoted to some problems, while others which seem just as interesting are ignored. If smart people have been arguing about something for 200 years, and no new sources or methods have appeared, I have trouble believing that my opinion will add anything to the conversation (this is Daniel Kahneman’s principle “thou shalt respect base rates, and not let thyself make excuses about why this time is different” and Edsger W. Dijkstra’s Third Golden Rule for Scientific Research [EWD 637]). On the other hand, as an ancient historian from Canada, I can think of some other reasons why research tends to clump. Those of you who share my interest in Achaemenid studies will have noticed changes to the very important Achemenet website, partially good (it now works without Adobe Flash player) and partially bad (old links to the transcriptions of Achaemenid tablets by Francis Joannès, Caroline Waerzeggers, and other scholars have been broken and PDFs replaced with HTML, so that a citation in one of my forthcoming publications is already obsolete). For several years Achemenet was hosted by the Musée du Louvre. On Friday 19 February, the editors announced that since November 2015 the Louvre has refused to let them determine Achemenet policy or continue to support their open-access journal ARTA and series of monographs Persika, and that they are therefore ending their connection with the Louvre and moving Achemenet to the ARSCAN laboratory in France. I quote their letter below without comment except for glossing a few names.